Hyundai has quietly updated the top variants of the Xcent and mid-variants of the Grand i10 to boost demand; Hyundai India's website shows the update as part of their 20-year anniversary celebrations in India. 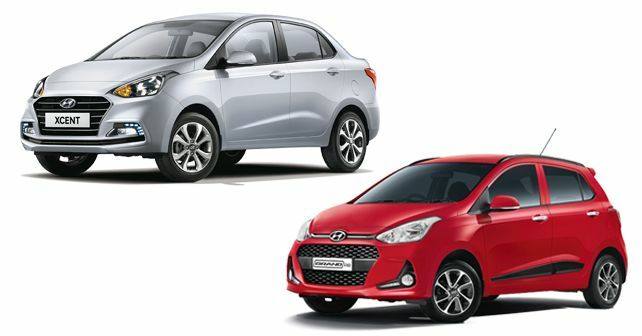 Amidst growing competition from products like the Maruti Suzuki Swift, Dzire and Honda Amaze, Hyundai Motor India Limited (HMIL) has silently updated its Grand i10 hatchback and Xcent compact sedan with more features. However, only select variants of both the models have received the updates, which are only cosmetic and feature-based in nature. No changes have been made mechanically. On the Grand i10, the mid-level variants have received the updates while on the Xcent, the top-spec variants benefit from additional features. Irrespective of which variant has been updated, the updates will certainly make these two models lucrative offerings in their respective segments. The Magna variant of the Grand i10 now gets a 7.0-inch touchscreen infotainment system with the brand's iBlue app connectivity. On the outside, the style quotient has been upgraded by introducing roof rails and body side mouldings. The higher-spec Sportz trim, on the other hand, gets LED Daytime Running Lights (DRLs), a rear spoiler and rear AC vents along with the iBlue app. The DRLs have been incorporated in the bumper, next to the fog lamps. Coming to the Xcent, the SX and SX(O), which are the top-spec variants, also get a boot mounted spoiler and a 7.0-inch touchscreen infotainment system with the Hyundai iBlue app. What's more, Hyundai has also equipped the Xcent with wireless charging, a feature which had made its debut on the Creta facelift. If the feature upgrades weren't enough, Hyundai has also announced cash benefits of up to ₹ 90,000 on petrol and diesel derivatives of the Xcent and benefits of up to ₹ 65,000 on the petrol variants of the Grand i10. The diesel version of the Grand i10 has not been left out of the scheme, which is now retailing with special offers and benefits. What's interesting here is that the top-spec Santro, that is, the Asta variant, is priced at ₹ 5.45 lakh (Ex-showroom). Despite being an entry-level hatch, the Santro still overlaps the next segment due to the similarity in the price band with the Grand i10.